A nationwide survey of over 1,200 third level students shows Fine Gael set to pick up over a third of student first preferences. 1,248 students were polled in a coordinated nationwide survey last week. FINE GAEL may already be set to score a runaway victory in Friday’s general election, but the party’s broad appeal has been underlined by a new student poll which showed that it was set to win more support from Ireland’s third-level students than any other party. A poll carried out in six of Ireland’s seven universities – UCD, Trinity College and DCU in Dublin, as well as NUI Galway, the University of Limerick and University College Cork – showed that Fine Gael was set to win the first preference votes of 34 per cent of student voters. That support is 4 per cent higher than that being given to Labour, who score 30 per cent of the student vote; Fianna Fáil lie well back on 10 per cent, while Sinn Féin are a further 4 points adrift on 6 per cent. The Green Party received a nationwide average of 4 per cent support, while independents and other candidates accounted for the remaining 13 per cent of support. Almost 24 per cent of the 1,248 students polled said they had yet to decide on how they would vote, however, meaning that there is still some ground to play for among the student vote. The nationwide spread underlined major regional differences in young voters’ intentions, however; while Fine Gael remained the most popular party nationwide, Labour was set to win the most support in UCD, at 33 per cent compared to Fine Gael’s 27.5 per cent. Similarly, only 12 per cent of UCD students named Enda Kenny as their most favoured prospective Taoiseach, compared to a 45 per cent level of support at UCC. Disappointingly for Fianna Fáil leader Micheál Martin – himself a native Corkonian – only 6 per cent of UCC students thought he would make the best Taoiseach, while one in six – 17 per cent – of NUI Galway voters preferred him to be the successor to Brian Cowen. Eamon Gilmore remained the most popular prospective Taoiseach, with a weighted average of 23 per cent support nationwide; Enda Kenny was three points behind on 20, while Micheal Martin scored 13 per cent, Gerry Adams 4 and John Gormley 3. Despite Sinn Féin’s nationwide average of 6 per cent, not one single student from Trinity College said they would be voting for a Sinn Féin candidate; similarly, nobody in DCU or the University of Limerick was set to vote for a Green Party candidate. The poll was coordinated by UCD’s College Tribune newspaper, and was also conducted by the University Times in Trinity; DCU FM and the College View newspaper in DCU; An Focal in UL, SIN newspaper in Galway, and by corkstudentnews.com in UCC. Polling was carried out last Thursday, February 17. Email “Fine Gael set to top student voting trends”. 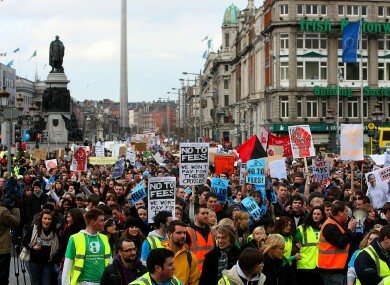 Feedback on “Fine Gael set to top student voting trends”.